Few royal ladies have attracted so much press attention and popular affection as Diana, Princess of Wales, and Kate Middleton, Duchess of Cambridge. They are linked by more than merely marrying father and son a generation apart. 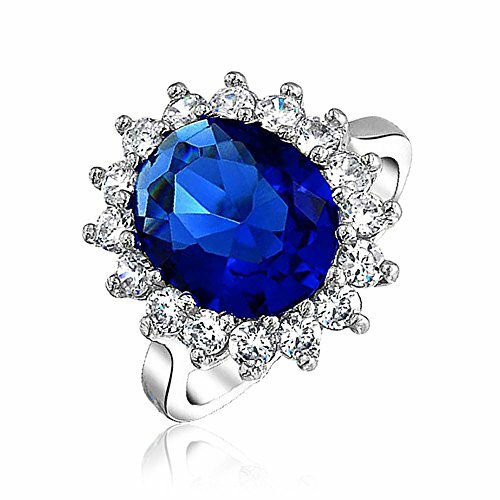 They both wear the exact same ring on their left hand - a token in Sri Lankan sapphire of the esteem in which they were held by their respective princes. During and following both weddings, reconstruction and/or replica royal engagement rings hit the market, allowing you to wear the betrothal ring of a princess. Regardless of whether you've actually found your prince! 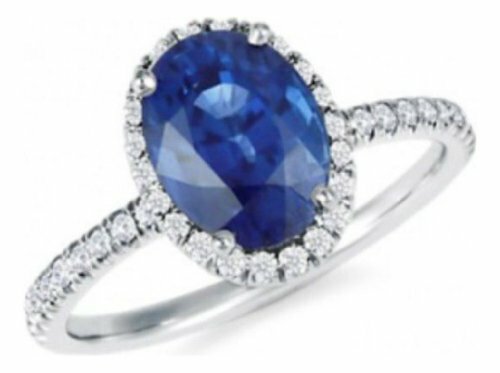 Sri Lankan Sapphire Royal Engagement Ring - The Facts! 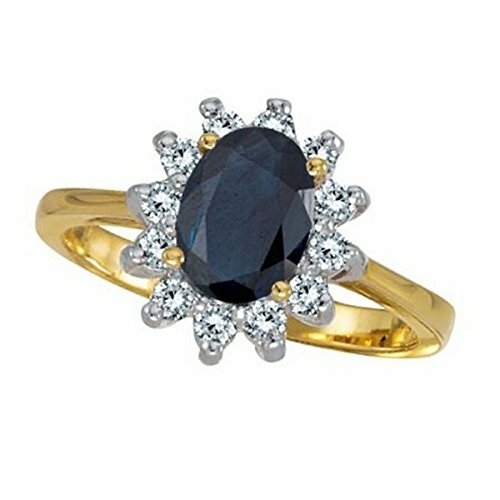 It's the engagement ring worn by Kate, Duchess of Cambridge, and her mother-in-law Diana, Princess of Wales, before her. But what is it? 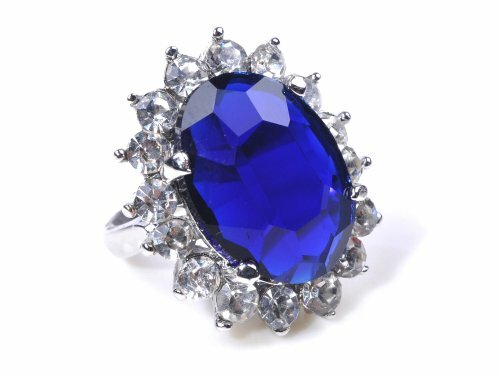 The royal Sri Lankan sapphire ring is probably the most photographed of its kind in recent history. Perhaps throughout all time! 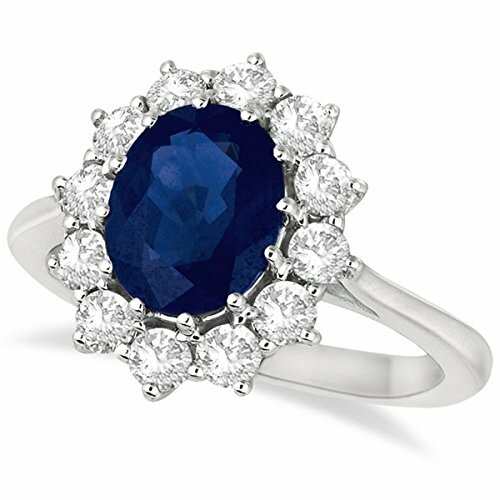 After all, two highly publicized, internationally adored royal women wore this engagement ring. Photographers all over the world wanted to grab an image. We've all seen it, but what is it? Each round diamond is 3mm in diameter. 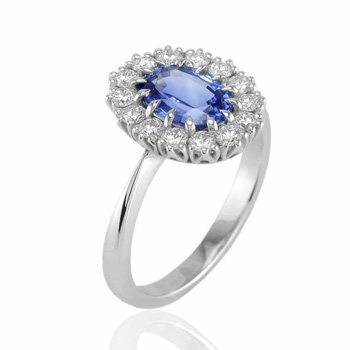 The sapphire oval measures 13mm x 9mm. 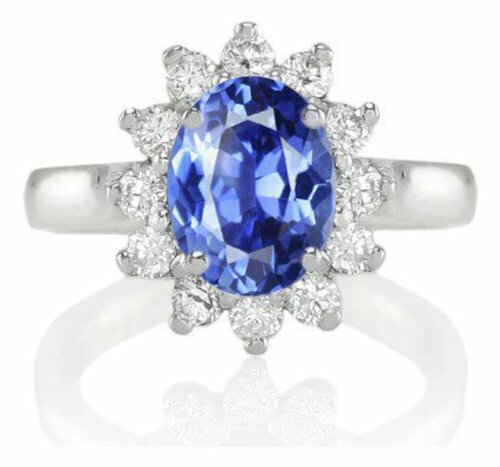 The diamonds' clarity are FL, and their color is D.
When the ring was first purchased, there were only eight white gold prongs holding the sapphire in place. At some point in 1981, the palace (or Prince Charles, or Lady Diana Spencer) had more added. The prongs nearly doubled in number to fourteen. That's one of the differences exhibited between Charles and Diana's engagement photographs, and William and Kate's, though both ladies are wearing the same ring. 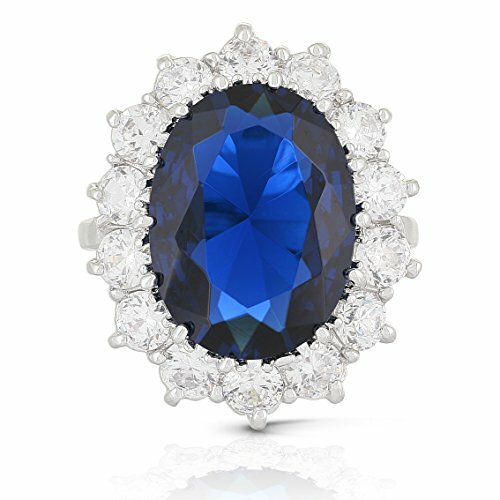 Today the Sri Lankan sapphire itself is worth around £178,000 ($300,000), while the whole royal engagement ring has been valued at circa £270,000 (nearly half a million dollars). That's quite an investment, considering there was change from £30,000, when Prince Charles bought it! 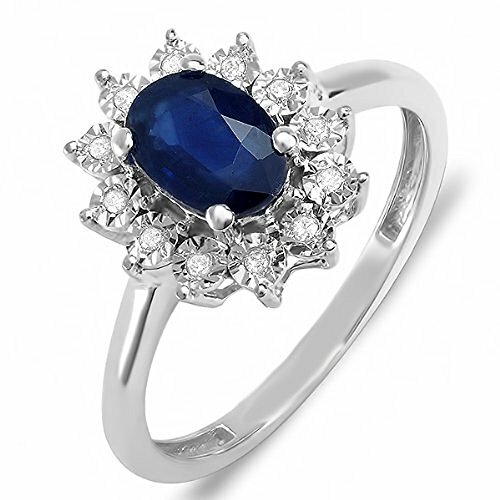 NB The gem is often called a Ceylon sapphire, but that's a little anachronistic. Ceylon became Sri Lanka in 1972, nearly a decade before Lady Diana ever picked out her engagement ring! They aren't exact copies, but that's because these American jewelers really don't want to be sued by Garrard & Co! These royal inspired engagement rings have price tags which are not for the faint-hearted. But if your pockets are deep enough, then you're looking at white gold and true gemstones, set into semi-familiar designs by jewelers in America. It was given to her by Prince Charles, but Lady Diana Spencer chose it herself. 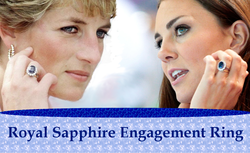 Even as a child, Lady Diana Spencer had always pictured herself eventually wearing a sapphire engagement ring. Her mother had one, which is probably where the future Princess of Wales found her inspiration. 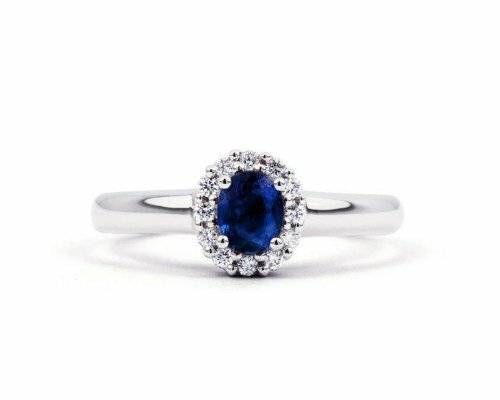 When given the opportunity to choose the engagement ring given to her by Prince Charles, Diana homed right in on the sapphires, breaking with royal tradition. Generally, regal brides received unique rings, created especially for them by jewelers vying for the chance to do so. The custom-made jewels tended to be personally meaningful too. Queen Elizabeth II's engagement ring contained diamonds taken from a tiara belonging to Prince Philip's mother, Princess Andrew of Greece. They had sentimental value for her husband. 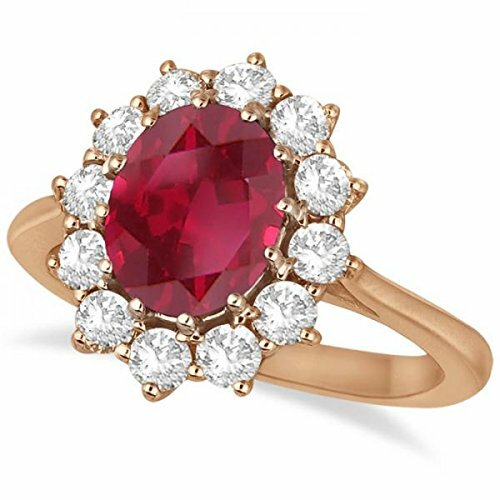 Princess Margaret's ruby ring was designed by her fiance Anthony Armstrong-Jones. It was clustered in the shape of a rose, as her middle name was Rose. Diana didn't bother with any of that. Her royal engagement ring came from the catalog. Granted, Garrard & Co's catalog wasn't the kind that presented jewels in the price range of your average citizen. 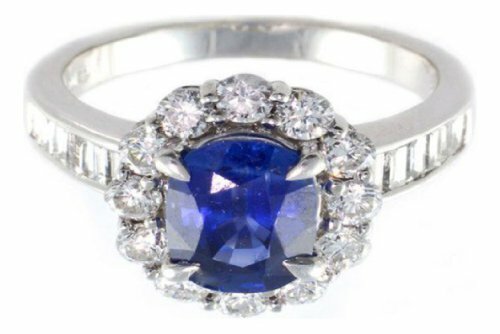 Princess Diana's sapphire ring knocked Prince Charles back £28,000. 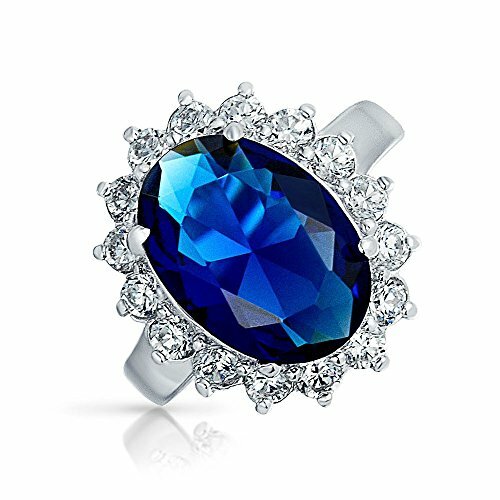 But that was still extremely cheap compared to those gems adorning the left ring finger of most royal ladies. Lady Diana didn't care. It was the one that she wanted. When Prince Charles and Lady Diana Spencer became officially betrothed, on February 24th 1981, the press had a field day discussing it all. And pointing out that Diana's engagement ring was still in Garrard's Catalog. Lucky Garrards had a boom time in sales from suitors keen to impress their brides-to-be with an engagement ring fit for a future Queen. The press might have sniffed about it, but the only one who really counted was happy. Diana wore the ring that she'd dreamed about since childhood, and she'd won her prince to go with it. More American made styles mirroring the design picked out by Lady Diana for her engagement ring back in 1981. Fairy tale royal wedding princesses tend to keep their dream engagement ring for years. Unfortunately real life doesn't always work like that. 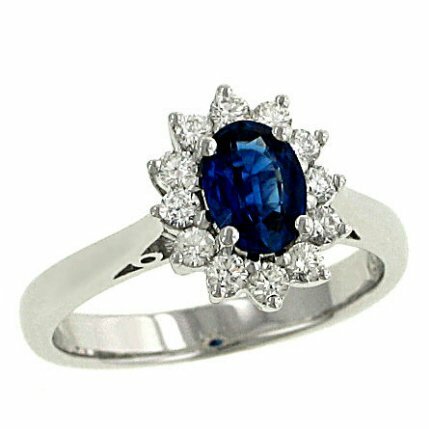 Princess Diana must have really loved her Sri Lankan sapphire engagement ring. Even after her divorce from Prince Charles, it continued to adorn the ring finger of her left hand. In fact, it remained in place right up until Dodi Al-Fayed replaced it with one of his own. The engagement ring of the Princess of Wales then went into a safe in Kensington Palace, where it stayed until her untimely death. Then Prince Charles took their young sons, William and Harry, to pick out a memento of their mother, before her estate was distributed according to her will. Prince William took her Cartier watch - another favorite, which she habitually wore - while Prince Harry chose to keep his royal mother's engagement ring. A few years later, after puberty had brought some deep introspection, Prince Harry came to a heart-rending conclusion about his keepsake royal ring. He told his brother that he wanted William to have it, on the proviso that it was given to his brother's bride, when the time came to propose. Harry's reasoning was thus - William was the heir to the throne after their father. Whoever married his brother would one day, all things being well, be Queen. Prince Harry wanted that lady to be wearing the engagement ring of Diana, Princess of Wales at the time. It would be like his mother made onto the throne after all. Prince William agreed. He swopped the ring for the Cartier watch, so each brother still retained mementos of their mother's beloved jewels. Then he committed the ring to the royal safe and waited. 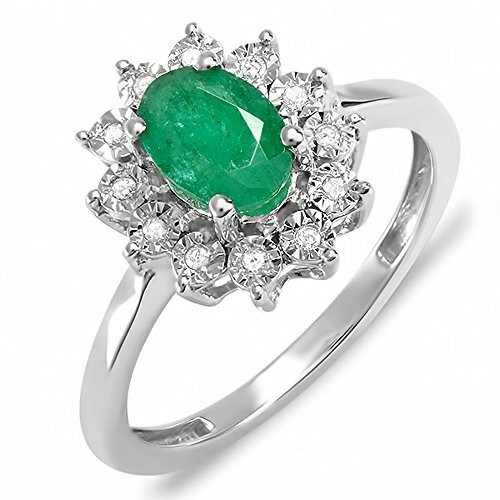 Jewelers have become rather creative in their royal inspired rings for engagements. The white gold has changed into pure gold and/or the stone is switched too. Prince William later said that he felt like a 'thief in the night'. It was his safe and his ring, but he didn't want to risk anyone else finding out what he proposed to do. 'Proposed' being the operative word. He sneaked his mother's famous engagement ring out of safekeeping and into the depths of his rucksack. There it remained, for three weeks, while the second heir presumptive to the crown - the man who will one day be Britain's monarch - tried to gather the courage to ask a commoner to marry him. 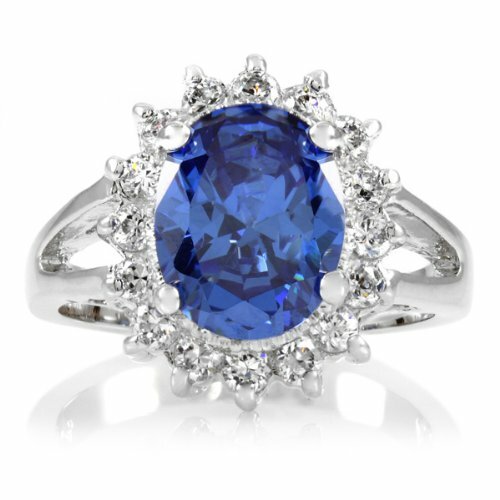 The press have begun to call that ring the Commoners' Sapphire, because Lady Diana Spencer (though more directly related to the Stuarts) was technically a commoner, while Kate Middleton was certainly without any titled ancestry. For three weeks trekking across Africa, every time Prince William went into his rucksack, he furtively ensured that he still had the ring. He had people to safeguard precious items, but he didn't want anyone to know that he had Diana's engagement ring in his bag. At the very least, they'd find out what he meant to do. More to the point, it was a priceless piece of jewelry. Not in monetary terms - it was expensive, but nothing that couldn't be replaced - but in sentimentality. Soon enough everyone would find out that he had the ring, particularly a certain lady from Berkshire. Of course, all those previously shown can be said to be designs based on Kate Middleton's engagement ring too, it's the same ring that was worn by Princess Di! 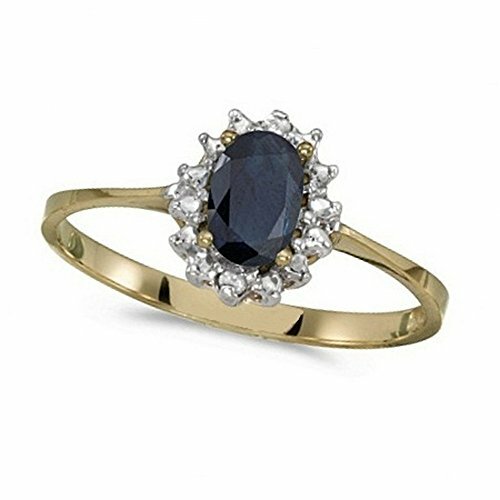 Further down the price range, these Duchess of Cambridge engagement rings are still crafted out of precious gemstones and gold. 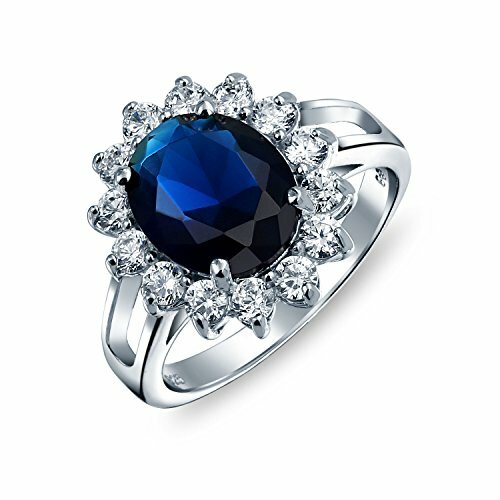 They would delight any royal fan, whom you would wish to make the queen of your world, with a valuable real world version of Kate's ring. Just when you thought that royal engagement ring couldn't become more famous, it was placed onto the finger of Catherine Middleton. Let round two begin! You would think Catherine's engagement ring is identical to that donned by Diana. In most regards, it is. But some tiny changes had to be made. The problem was that Princess Diana and her son's new bride had different sized fingers! It must have been an awkward fit, when Prince William attempted to slide the ring onto Kate's third finger in that beautiful room in Kenya. But by the time their betrothal was made official, on November 16th 2010, some repair work had been done. When Princess Diana wore her engagement ring, it was a size H. Kate Middleton's ring is a size I. She had two platinum studs added into the white gold band, in order to expand it. After Lady Diana first showed off her engagement ring, Garrard & Co reported 'millions' of calls from customers wishing to reserve one for themselves. After all, it was in the catalog and available for anyone to purchase. History not only repeated itself when the engagement ring of Kate Middleton was flashed around the world, but the rush was truly international too. In the three decades that had passed between the two events, thousands of companies had created replica Princess Diana engagement rings. Some were cheap imitations, others were designs like those already showcased here today. They ALL flew off the shelves! 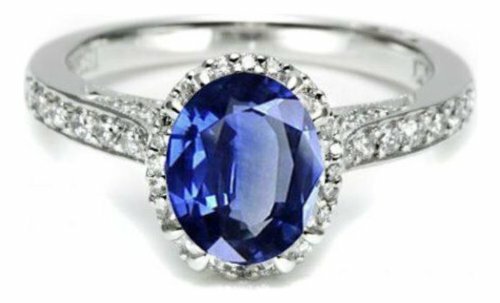 Jewelers across the globe have reported that sapphire engagement rings (in particular those with a Ceylon sapphire, aka Sri Lankan) have become so popular, that they're beginning to challenge diamond rings as THE one with which to pop the question. 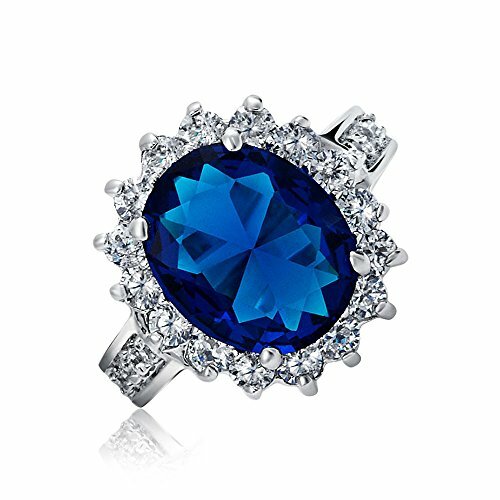 The Kate Effect is alive and kicking, taking the Duchess's sapphire engagement ring with it! These designs of Kate Middleton inspired engagement rings look the part, while not denting your wallet too much. 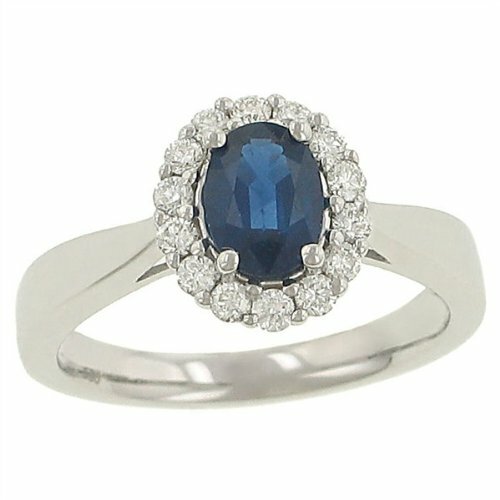 Every new bride wanting to emulate Kate with their sapphire rings is a trend that isn't about to slow down any time soon! 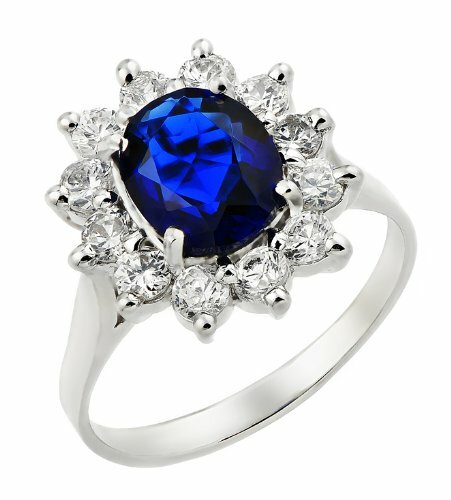 By swopping sapphires for zircon or colored crystal, these imitation Kate engagement rings all come in at under $50. While these are even cheaper! 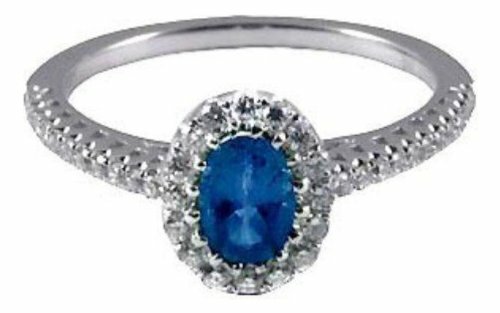 The first two Kate Middleton cosplay engagement rings sell in their hundreds at under $15. The last one is a mere $4. The titles in the monarchy can be so confusing. Why is Prince Phillip not king when Mary I's husband of the same name was? Here's a brief look into the convention of titles. 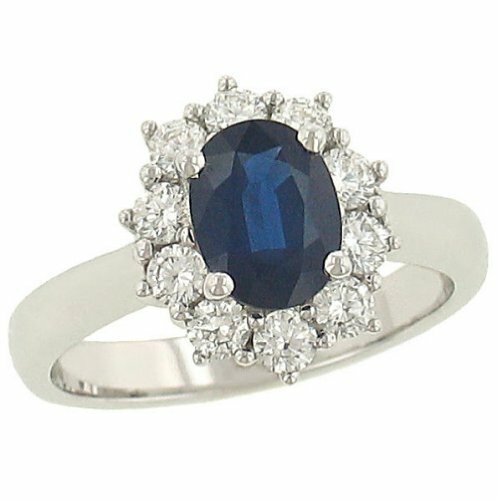 The royal engagement ring is such a beauty no wonder everyone wants one too! They're beautiful, aren't they? I'm glad that you liked them. I think that the Diana made a great choice in engagement ring. 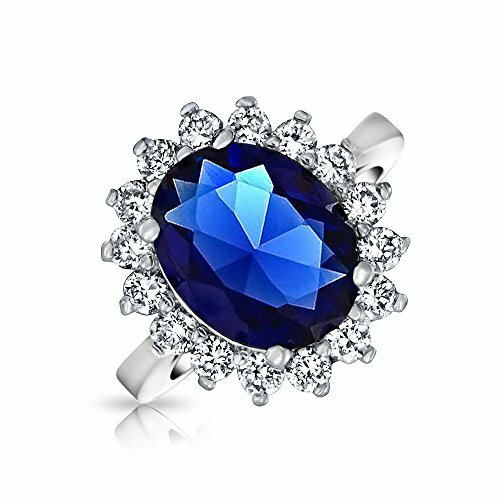 I'm not surprised people use such sapphire rings to pop the question :). Nice article, and great selection of Diana and Kate-inspired rings! (Thank you, thank you. *bows*) LOL I like the tune. Yes, those stones can be ridiculously expensive. Personally, I'd be too scared to wear one for fear of losing it. I think it's fitting enough for this article topic. And, also, I really think you should definitely listen to it, I honestly, really, definitely think you'll like it. In fact, it'll probably change everything you think you know about music, really. (Your background made me giggle when I noticed it, it is fitting).